Among the religious community, there’s a huge problem of agunot — that is, women who want a divorce from their husbands, frequently because of abuse or other severe problems, and whose husbands refuse to grant the divorce. 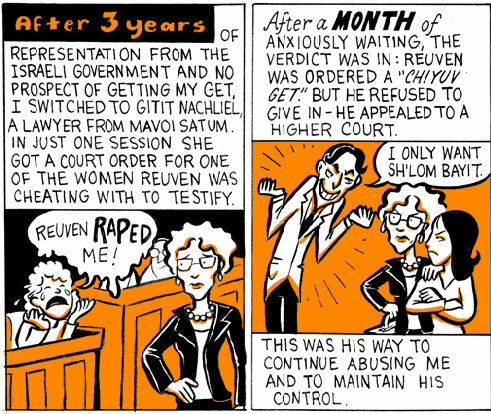 Because a Jewish legal stipulation puts divorce solely in the husband’s court — a safeguard from when husbands were required to provide food, money and shelter for their wives, whether or not they were still “together” — it’s become a huge problem in recent times, when to be spiteful, malicious, or merely because of indifference, some men will divorce their wives, sometimes even dating or remarrying, without granting their wife a get. Among the religious community, there are also a number of insanely heroic people who have made it their life’s work to stop these miserable excuses for people. At the forefront of this battle is Mavoi Satum, whose former director, Inbal Freund, is also a gifted writer and performance poet. 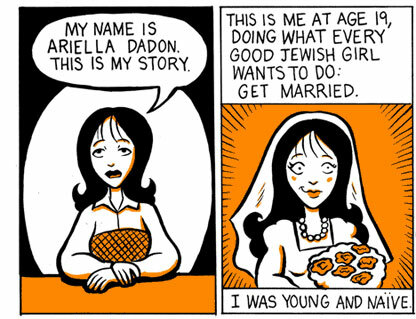 She and artist Chari Pere (whose work, btw, you’ll be seeing on our site pretty soon) went to visit one of Mavoi Satum’s clients, spent two hours interviewing her and listening to her story, and developed this three-page comic. Pass it around. Spread it everywhere. And let people know that prenuptial agreements aren’t just for Donald Trump and his prospective ex-wives — they’re for anyone who wants to avoid years and possibly decades of heartache, legal battles, and trauma for kids that you haven’t even conceived of yet. Jewish authorities do not object to fertility technology, but have concerns with some of the specific methods.